I’m a curious person and love trying out new things. When “Cook’s Illustrated”, one of my favorite food magazines, published a gluten free cookbook, I bought it, out of curiosity, even though I have no problems with gluten. I was especially interested in how the culinary geeks from “America’s Test Kitchen” got to their good looking results. My own trials, though taste-wise acceptable, left a lot to be desired regarding their consistency. When my lovely hairstylist asked me whether she could order some gluten free rolls for her Christmas menu, I jumped at the opportunity to try a recipe for dinner rolls from “The How Can It Be Gluten Free Cookbook“. The additional baking powder and lemon juice help with softening the crumb, making it less dense. 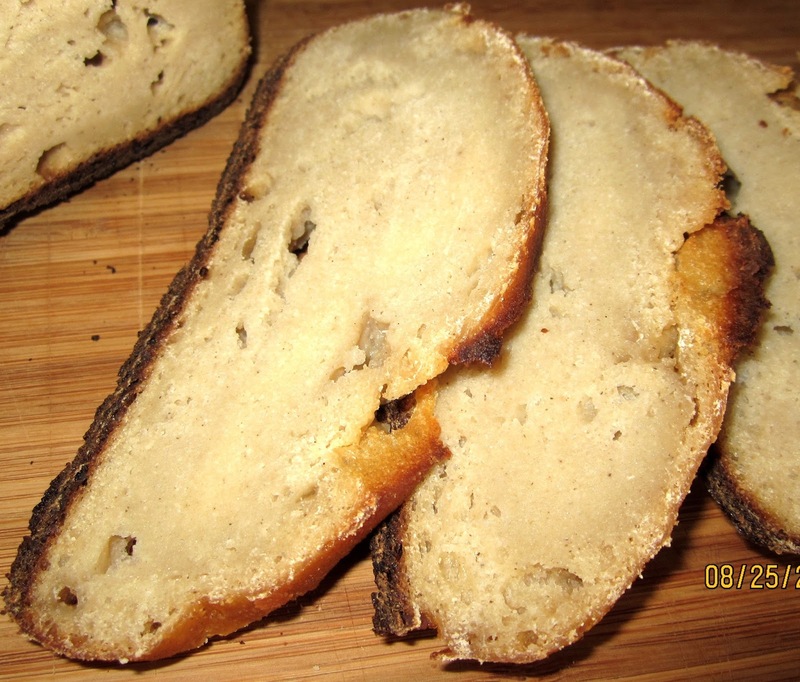 The flours should be finely ground – I used Bob’s Red Mill brand. 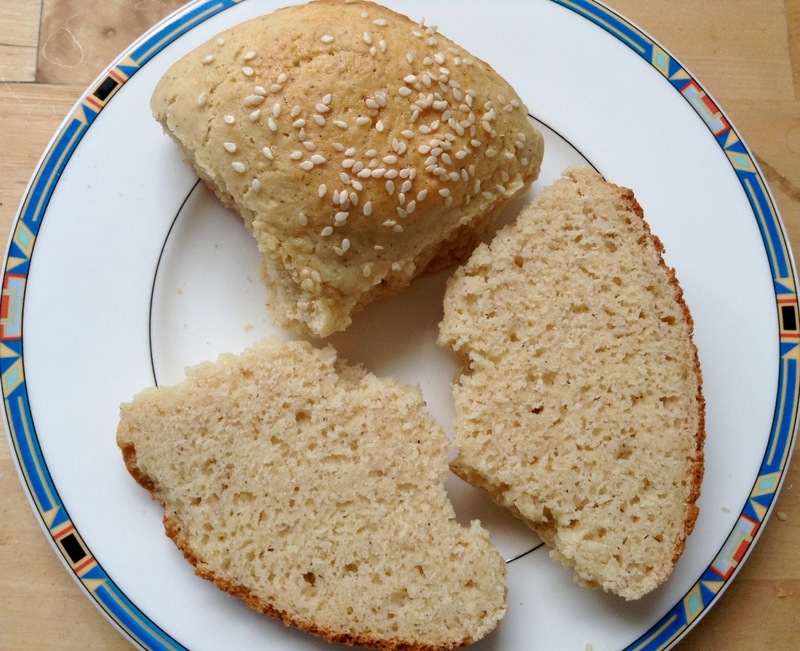 My first trial resulted in nice fluffy rolls with a consistency like English Biscuits – better than anything I had seen so far in gluten free breads. Fluffy crumb – but too bland and doughy for my taste! Danielle assured me, that she liked the gluten free rolls – but I couldn’t stop thinking about them. I don’t like selling something I’m not 100% satisfied with. 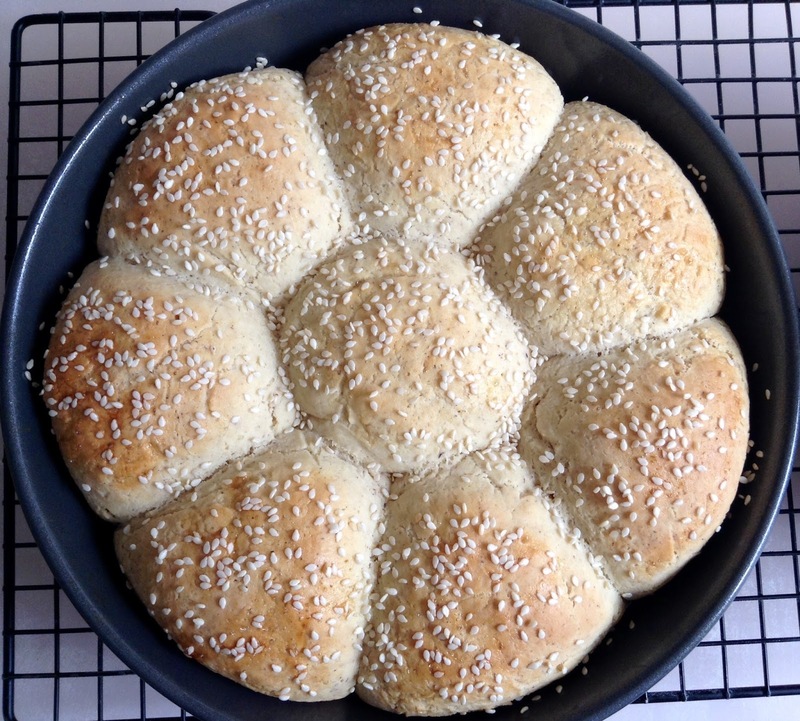 There was nothing to criticize about the structure of the dinner rolls – the test cooks with their scientific approach had really given their best. In my pastries, I often substitute a quarter of the white flour with whole grain – without any problem. I would to try the same with the dinner rolls. To keep it simple, I decided to limit my trial to four likely candidates: oat, buckwheat, and teff, and one nut meal: hazelnut. 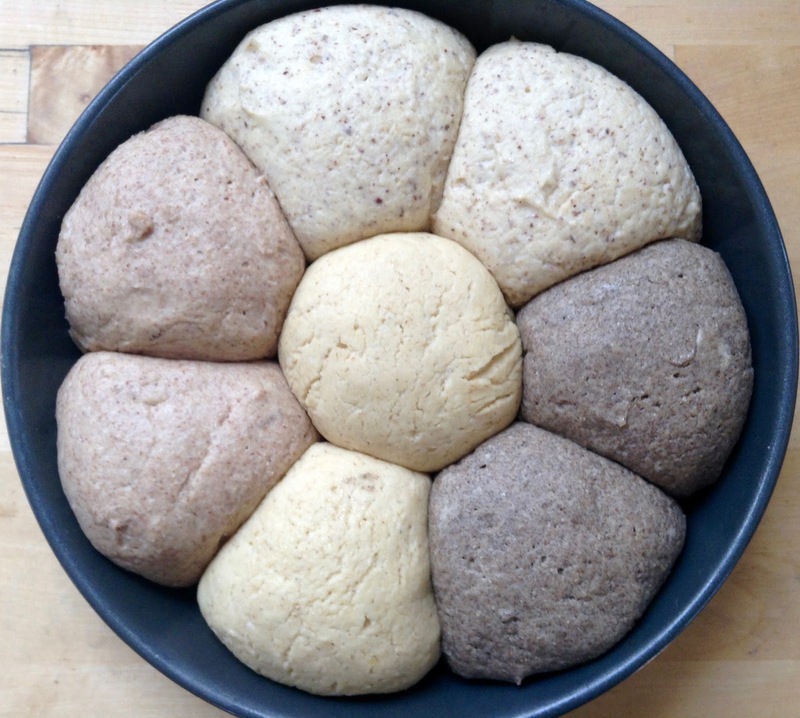 Since I didn’t want to feed my long-suffering husband with gluten free test rolls for weeks, I intended to use all four flours in one pull-apart cluster. 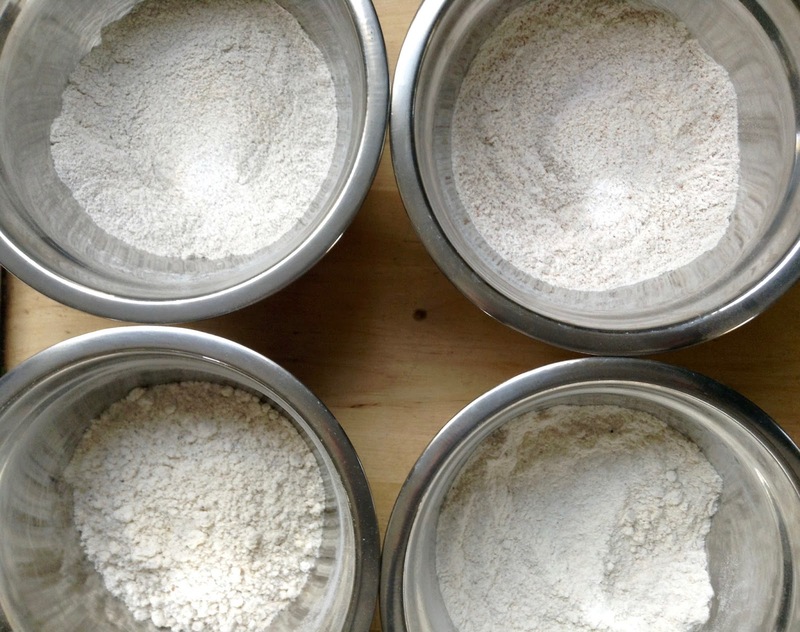 After some calculations, I prepared four flour mixtures (for two rolls each). Then I mixed these small dough amounts with a handheld mixer, one by one. 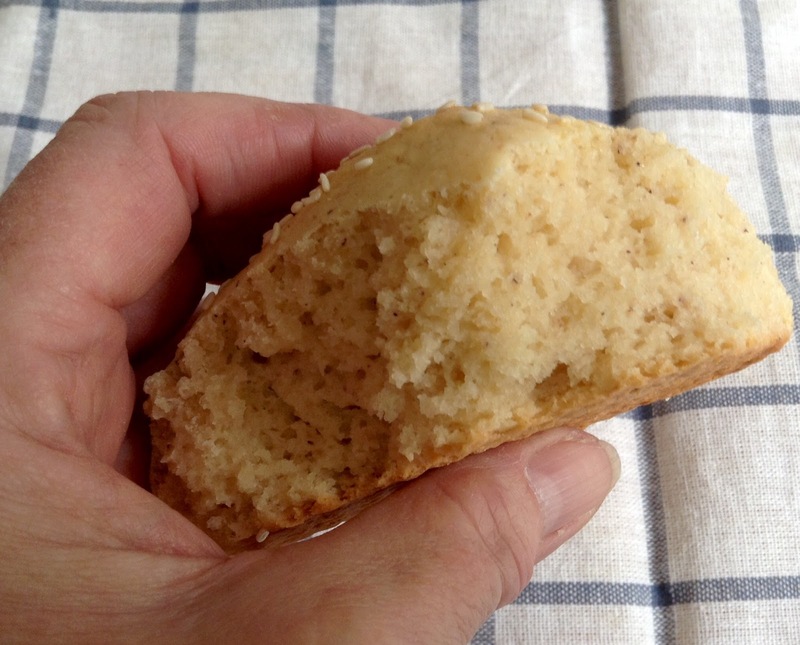 Since there was no gluten structure to develop, longer kneading was not necessary. 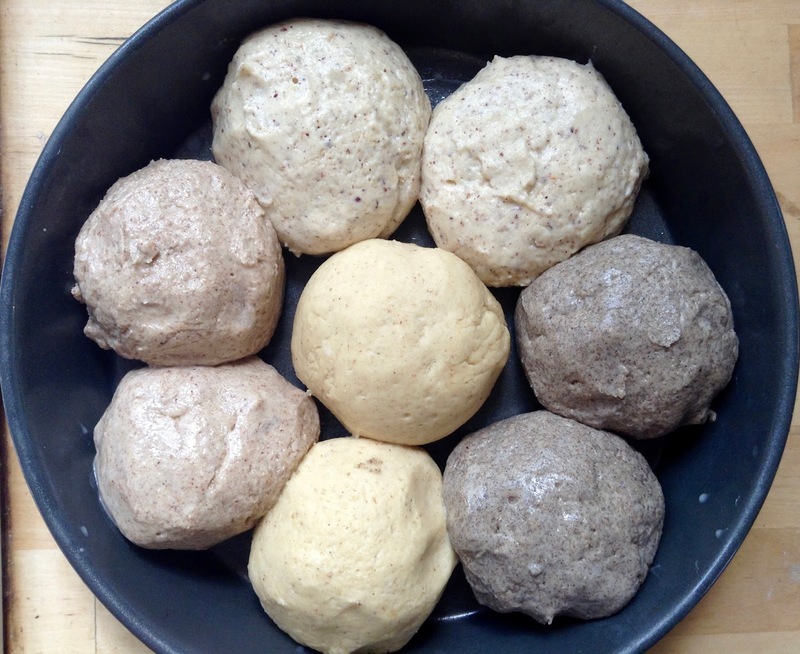 Doughs with buckwheat, hazelnut, oat, and teff flour. I was rather relieved when I was able to shape all of the doughs into rolls – the one with nut meal (my secret favorite!) was especially sticky – (you need to roll them in your wet hands, like dumplings). They rose as nicely as the ones from the original recipe, and showed the same fine pores when I cut them. And the best of it – each of the four test candidates tasted good (even when eaten on its own!). To make a side-by-side comparison easier, I cut the cluster into slices, like a loaf, instead of breaking it in single rolls. *) If you want to make a gluten-free cluster with all of the 4 different kinds of flours (like my test batch) scroll down for the recipe. Spray a 23-cm/9-inch round cake pan with oil spray (a springform pan works fine, too). 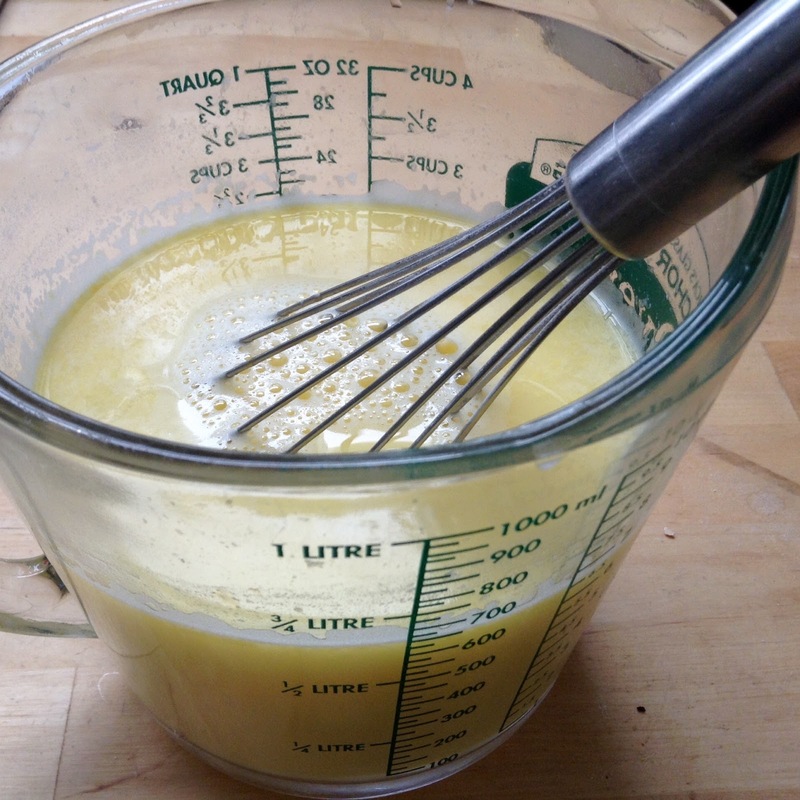 In a liquid measuring bowl, whisk warm water, lemon juice and egg plus yolk together. In the bowl of a stand mixer, fitted with paddle, on low speed, mix together gluten-free flours, potato starch, tapioca, milk powder, psyllium, sugar, yeast, baking powder, and salt, until combined. Transfer dough to a lightly oiled work surface. Divide it into 8 approximately equal pieces. With wet hands, roll each piece in your palms as if you would shape a dumpling. Place one roll in the center of the pan, and arrange the other seven around it. Mist rolls with oil spray, cover loosely with plastic wrap, and proof for about 1 hour at room temperature (they should double in volume). Preheat oven to 375ºF/190ºC (steaming not necessary). Brush rolls with egg glaze, and sprinkle with the topping of your choice. Bake rolls for about 40 – 50 minutes (rotating pan 180 degrees after half the baking time, for even browning), until they are golden brown. Allow rolls to cool for 10 minutes in the pan on a wire rack, then invert pan onto rack. Let them cool for 10-15, and serve warm. They keep (wrapped) at room temperature for 3 days, and, also, freeze well (wrap in plastic and place in a freezer bag). Add 25 g/0.9 oz of either oat, buckwheat, teff or ground hazelnuts into each bowl, and whisk to combine. Pour about 98 g/3.4 oz of the liquid ingredients into each of the small bowls. 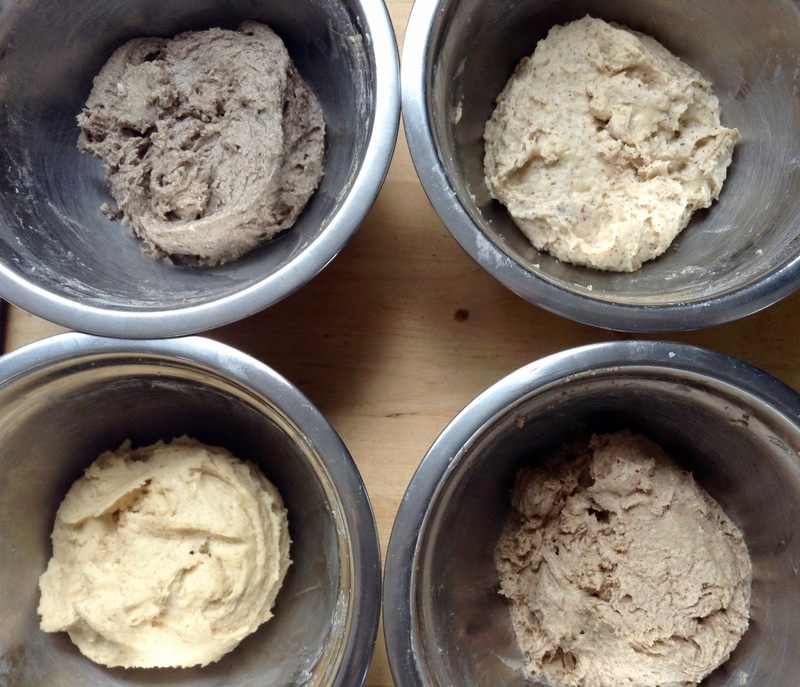 With handheld mixer, mix each dough, one by one, until well blended. Place 21 g/0.7 oz of the butter pieces into each of the bowls. Again, mix each dough, one by one, until well blended. With wet hands, shape 2 rolls from each dough. 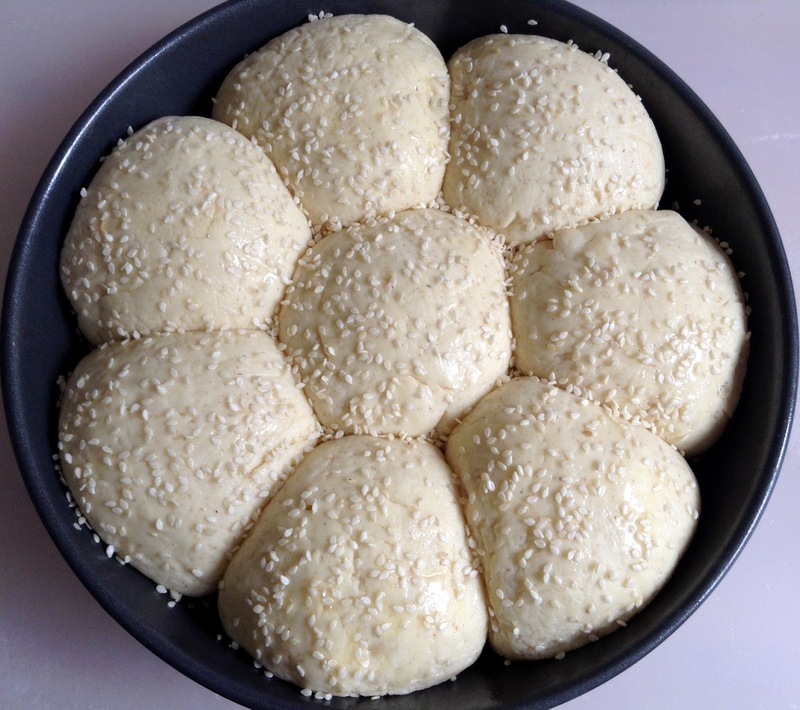 Arrange rolls in prepared pan, placing one in the center. Otherwise, follow the steps in recipe above. Barbara Elisi from Bread & Companatico wrote a really interesting series about gluten sensitivity that gave me some new insights: Am I Gluten-Sensitive? – My Troubled Wheat Love Affair. Next Post STICKY BUNS WITH CROISSANT DOUGH – FINGER-LICKING GOOD! Thank you for your sleuthing and I will try this. Never had a problem with your recipes yet! Wow! I admire your determination, Karin! I'll forward your delicious experiment to my coeliac friend who will be very excited indeed! Hello I am writing because I'd like to make some gluten-free rolls for my sister-in-law. The problem is she also has a rice allergy. Many gluten-free products Unfortunately have rice flour. Can you recommend a substitute for the rice flour? Thank you for your help. Thanks, Ginger, I hope your friend will like them! My husband favored the oat and buckwheat – I liked the hazelnut and the teff best. That must be a real hassle for your sister in law, not only having problems with gluten, but, also, with the main gf-flour used as substitute! You might try this recipe with sorghum flour (for the white rice) and one of the other gf-flours, like teff, instead of the brown rice. Good luck, and, please, let me know how they turn out. I used to think f we ever made GF anything it would mean the end is near – but no longer – the end is just closer than reasonably comfortable….and it is your, or Lucy's fault as usual. These look delightful. 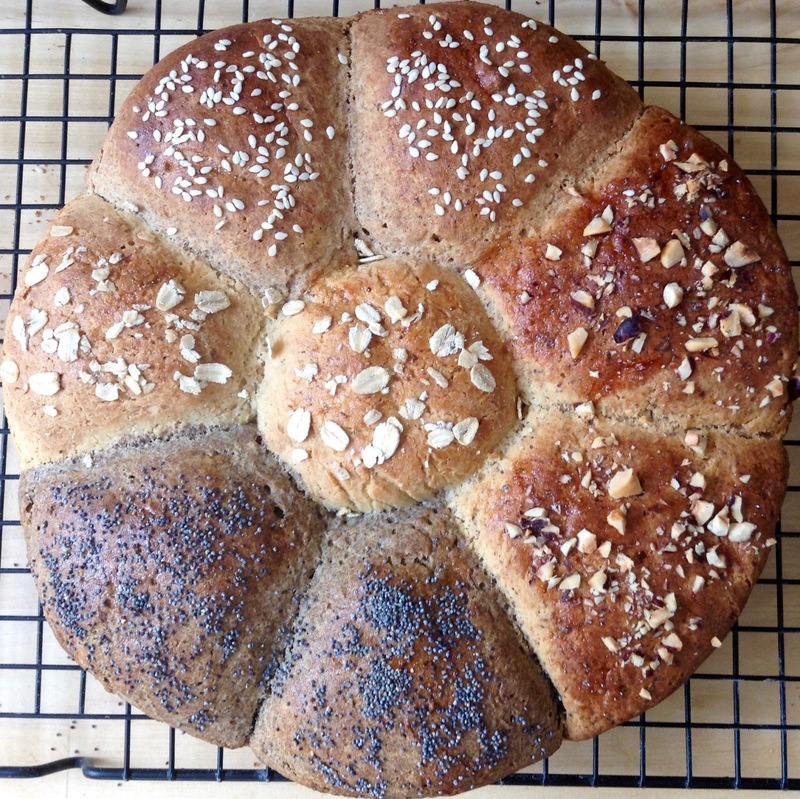 Lycy being a floozy would mix all the grains together and make one kind but I do like your multi roll in the same pan method. Well done and happy baking Karin. Haha, I thought the same! But I am really glad that it is possible to come up with a decent gluten free bread, not like the expensive store-bought stuff that tastes cardboard. they look beautiful! I have found that teff flour adds a certain nutty flavor as well as color. There is an ivory teff available but I don't know what the flavor is like. Great write-up and I will have to try this. I dabble in GF. Interesting – I never heard about ivory teff, I will check it out. Here in Maine grows an albino variety of buckwheat that is milder than the regular dark one. Thanks for visiting, and let me know whether you like the rolls, if you try them. my mom is much worse shape than me (she developed IBS and wheat intolerance several decades ago but did not do anything about it as she did not realize her symptoms had anything to do with wheat until recently) and now she can only eat gluten and wheat starch free bread. I will do these for her before I go visit for Easter! and thanks a lot for spreading the word about my blog posts on the mechanisms. part 3 is now out, looking forward to hear your thoughts! Thanks, Barbara! I hope your mother will like the rolls. 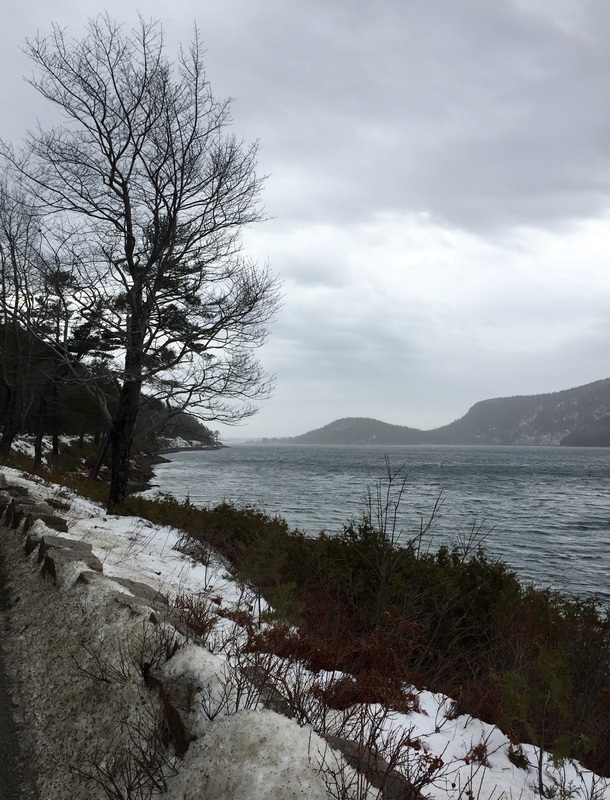 I will head over to your blog right now, to read part 3. Hallo, Careen, wie schön, dass dir mein Blog gefällt. 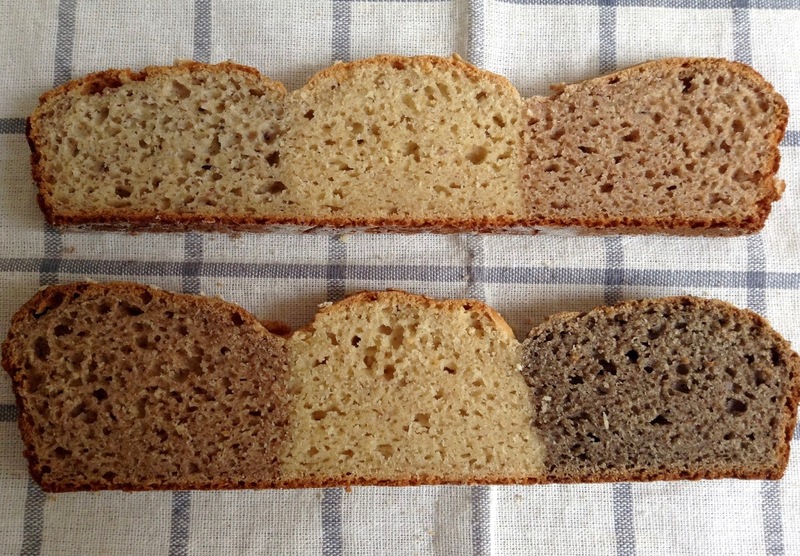 Die glutenfreien Buns werden euch bestimmt schmecken – leider sind viele glutenfreie Brote ja etwas fade, was Amerikaner anscheinend weniger stört, weil sie so an weisses Brot gewöhnt sind. Über eine Rückmeldung würde ich mich freuen, wenn du die Buns ausprobierst.